South Texas prepares as heavy rains from Tropical Storm Dolly threaten flash floods and mudslides in mountainous areas in Mexico's Gulf coast. Heavy rains from Tropical Storm Dolly threatened flash floods and mudslides in mountainous areas as it moved in from Mexico's Gulf coast, where authorities had readied shelters and suspended school classes on Wednesday. The U.S. Hurricane Center said Dolly was located about 30 miles south-southwest of Tampico early Wednesday morning. The storm's maximum sustained winds were near 45 mph and it was moving to the west at 8 mph. 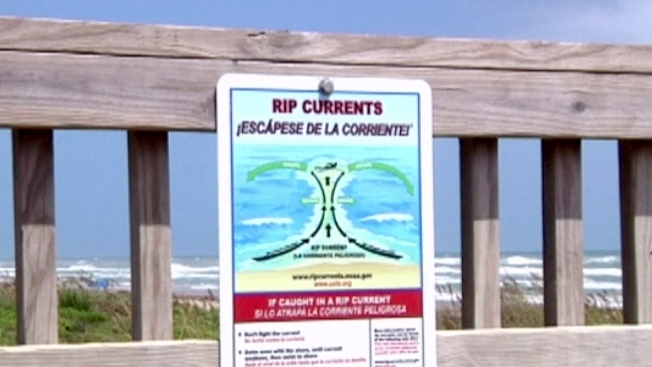 Crews put up red flags around South Padre Island Tuesday to signal the forecasted high surge and dangerous currents. Officials urged even strong swimmers to avoid the water during the coming week. The storm was expected to bring 5 to 10 inches of rain to states of Tamaulipas and Veracruz, along the Gulf coast and inland. Life-threatening flash floods and mud slides were possible in mountainous areas. Tropical storm force winds extended outward up to 140 miles but weakening was expected over the next 24 hours as Dolly moves farther inland. Tamaulipas state authorities said earlier in the day that shelters were being readied and that classes would be suspended Wednesday in several municipalities along the Gulf coast. Authorities in neighboring Veracruz state ordered classes in the whole state suspended. By Tuesday evening, several streets in the port city of Veracruz had flooded and least two streets where electric workers had been doing underground work had collapsed, damaging a house and several cars. Meanwhile, Tropical Storm Norbert formed off Mexico's Pacific coast on Tuesday. By the late evening, Norbert's center was about 120 miles southwest of Cabo Corrientes, or about 300 miles southeast of the southern tip of Baja California. Hurricane forecasters said that on its current track, Norbert is expected to move away from the southwestern coast of Mexico early Wednesday, and approach the southern tip of the Baja Peninsula on Thursday. Maximum sustained winds were around 50 mph, and the storm was moving north-northwest at 8 mph.